It's sort of like the first day of school over at the NovaCare Complex Monday. Like many teams, the Eagles are beginning Phase One of their offseason workout plan. While this is all voluntary, many Eagles will be reporting to the team facility, including backup quarterback Nate Sudfeld, who has signed his restricted free agent tender. 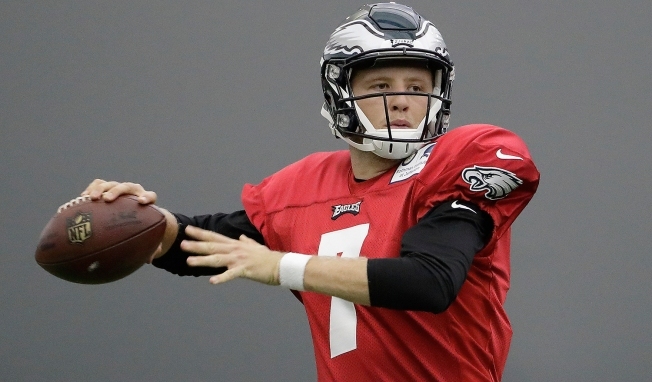 Sudfeld has played just three career games, but he'll have an important role in 2019, taking over the backup position from Nick Foles, who is now with Jacksonville. Based on Wentz's injury history over the past couple seasons, Sudfeld could be an important piece to this puzzle. While the Eagles can be back in the building in an official capacity today, there's nothing that even resembles football going on over there. All of these rules are mandated by the CBA. In Phase One, which lasts two weeks, it's basically all strength and conditioning work. Coaches aren't even allowed on the field yet with players. And footballs can't be used, unless quarterbacks want to throw to uncovered receivers or kickers want to kick. No helmets either. After these two weeks, Phase 2 begins. Coaches are finally allowed on the field for individual drills, but still not team drills or 1-on-1s. May 21-23, May 28, May 30-31, June 3-6. The only mandatory portion of the Eagles' offseason is the minicamp June 11-13. After that, the players are free until the start of training camp in late July/early August.